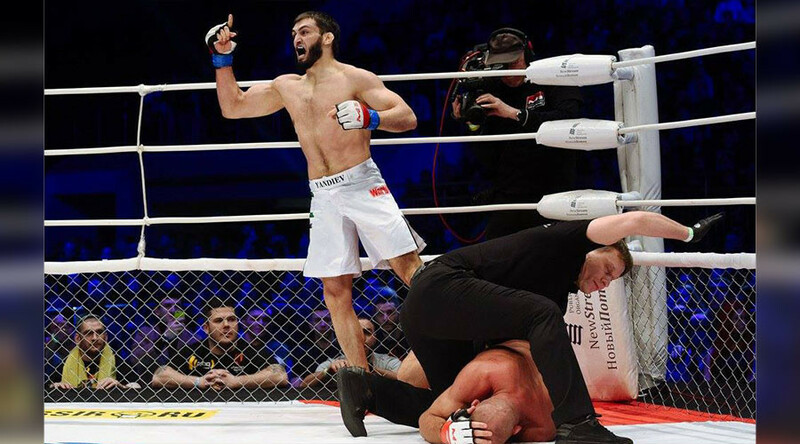 Russian MMA fighter Abukar Yandiev didn’t leave anything to chance in his lightweight championship fight against Alexander Butenko at the M-1 Challenge 74 event in St. Petersburg on Saturday night. Ingushetia native Yandiev has never seen a third minute in any of his bouts, finishing five fights via submission and three by way of technical knockout. Saturday night show was no exception. The former judoka - who stood 8-1 in professional MMA coming to the bout - produced a stunning right hook that sent defending champion Butenko to the canvas just seconds into the first round. Yandiev then delivered a brutal ground and pound to his opponent, forcing the referee to step in and wave the fight off. Talking to RT Sport after the fight, Yandiev admitted that the the explosive start was a part of his fight plan. “My plan was to be explosive from the start,” said the new M-1 Global champion. RT: Giving that all of your fights ended in the first round, can you call the quick start your trademark? Abukar Yandiev: Back in the days when I used to compete in Judo I also won most of my bouts in the first minute. Only rarely my judo fights went the full 5 minutes. RT: What is your future plan? Will you defend your belt or move to another promotion? AY: I don’t know if I will stay with M-1. My goal is the UFC. But if we are talking about top contenders (to my title) inside M-1, I’d say Damir Ismagulov. RT: Who congratulated you first on the victory? AY: My coach, my team and my friends. Plus the head of the Republic of Ingushetia, Yunus-bek Yevkurov congratulated me over the phone. RT: Who would you fight in UFC if you made the move? YA: I don’t really have anyone in mind. Whoever they would give me. I am ready for anyone.